This is one of a series of visual language translators customized to meet the needs of first responders for Prince George's County, MD. The county equipped all first responder organizations with thousands of translators to support the applications of disaster assistance, emergency medical service and a specific publication designed to support translation for their large Spanish-speaking population. 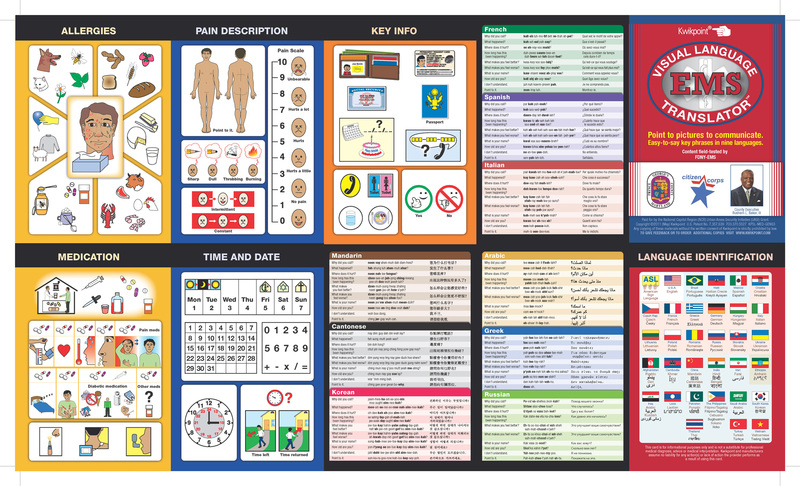 The EMS publication has visual translations for cuts, shock, burns, falls, assault, car crashes, sexual crimes, ingestion, key medical symptoms, pain, allergies, medications and key phrases with phonetic pronunciation in Korean, French, Greek, Italian, Greek, Russian, Arabic, Mandarin, Spanish and Cantonese. The publication is laminated and folds flat.